Nine miles, but hey those are nautical miles! 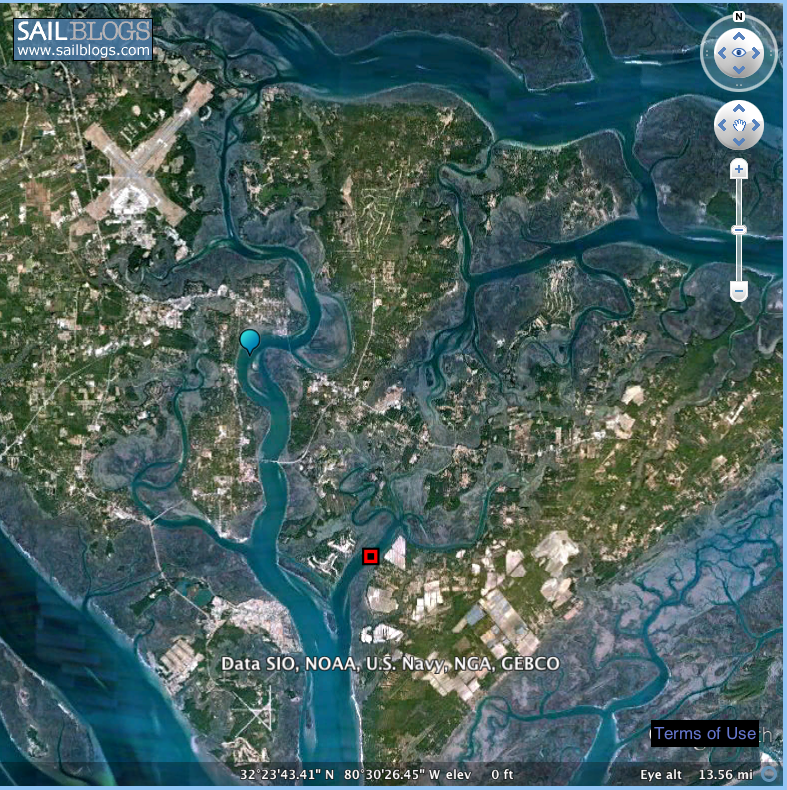 When we arrived yesterday in Port Royal Sound bound for the city of Beaufort South Carolina, we had to anchor in Cowen Creek (red box in photo above) because the tide was so high that the vertical clearance at the fixed bridge standing between us and Beaufort was not enough for Moonshadow's 66 foot mast. We had a quiet night at Cowen Creek, then motored up the river past all the Marines at Parris Island, while Deb enjoyed her morning chai-green tea and used nature's hair dryer. Eat your heart out leathernecks! 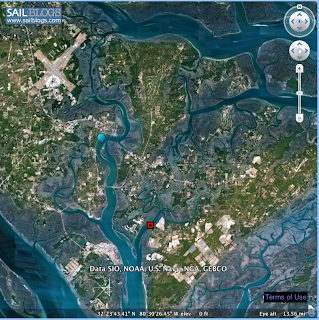 We passed under the bridge, anchored just out from the City Marina (at the blue mark in the map above) where we tied the dinghy to the public dock and explored the beautiful town of Beaufort, SC. That's BEW-furd. North Carolina has a city named Beaufort, but they pronounce it BO-furt. This town is one of the few that was not destroyed during the Civil War. That's because Beaufort was one for first to fall to Union hands. The result is a beautifully intact town with very old homes. There is an Historical Landmark District with 90 homes that are designated historical sites. Some of the live Oak trees in Beaumont predate the city's 300 year old charter. Boy if these old trees could talk they'd have some stories to tell! The branches stretch out horizontally forever, and cry out for swings and treehouses, but we only found one tree with a swing. After a few hours strolling around Beaufort, shopping and lunch, we thought it was time for a swim in the river's 80 degree water. With a bit of current running, it was like we had one of those small lap pools as we swam and swam just to stay even with Moonshadow. John has always wanted to stay at a hotel with a swim up bar, and now we own one! We've blogged a lot about the weather so here's some evidence of what happens in this part of the world. These next three pictures cover a span of about 40 minutes; from a dead flat calm with a few threatening clouds; to a 180 degree windshift with gusts to 30 knots and rain; and then back to a peacefully calm beautiful afternoon. Next up, we plan to proceed to Charleston, South Carolina. We had planned to sail there in the Atlantic, but wouldn't you know it, the forecast is for 15 to 20 right on the nose. 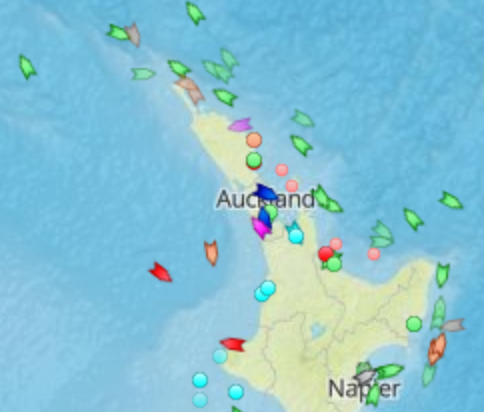 Since we'll be burning diesel either way, we started looking at the inland route and found it is about 15 miles shorter! We will have to battle a "swing bridge", two fixed bridges, and a "bascule bridge" (drawbridge) to get there. The timing of our arrival at low tide at each of the two 65' fixed bridges 20 miles apart may prove to be more that we can do. If so, we'll anchor for the night and continue the next day. Great post, and I love your Swim-Up Bar. Happy Hour, any time you want it.